← Just in case you all thought I’d disappeared! And it was still there! 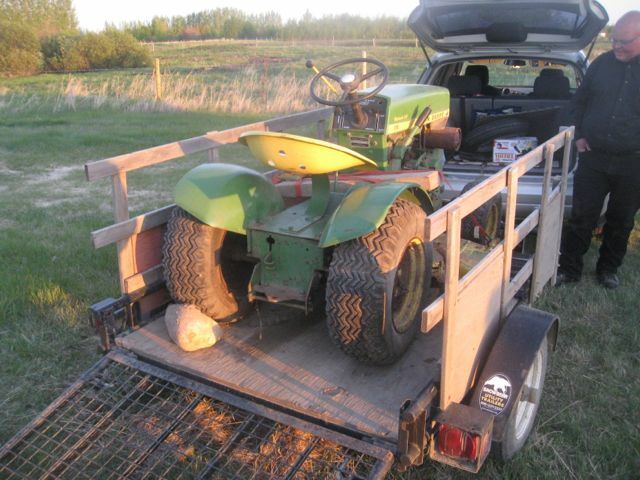 LOTS of callers, but nobody had showed up… So we finished supper, I grabbed a schwack of tools, the battery outta LittleTractor, the winch (just in case), hooked up the trailer, we bundled LTBabe into the car, and off we went! Not even 20 minutes out of town! We had a really good chat with the owner, it had belonged to a friend of his, but hadn’t been used for 20 years… When his friend passed away, he had taken on cleaning up the estate… We pulled the belt cover, the engine still spins but I couldn’t feel any compression. Put the battery in, turn the key, nothing… Things are a LITTLE rough on it, BUT its a hydraulic Lift [Insert chorus of singing angels here]… BUT I need another not running tractor like I need a hole in the head… BUT its a hydraulic lift! AND its totally complete (aside from the generator light glass). AND LTGal STILL says its alright… The PO said “make me an offer”. So I did… And guess what?!? LTGal says this is NOT a way for her to be able to get another bike… In fact, I have SO blown through parity between bikes and tractors, ONE of the tractors will have to go… In the meantime, I gotta find some place to keep ANOTHER tractor! I LIKE having that problem! Oh, and we don’t have a name yet for this tractor… No serial number for it YET, ’cause I forgot to jot it down before things got too dark… Off to bed for ME! 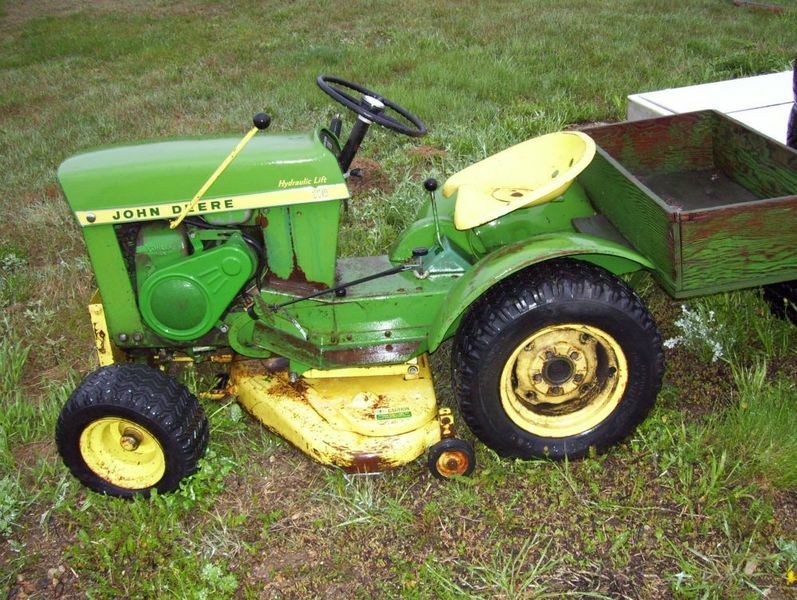 This entry was posted in Geeky Tractor-y Stuff, Wally and tagged John Deere 110, restoration. Bookmark the permalink. One Response to I LOVE LTGal! Just please get Ernie (or one of them) fixed so we have a working tractor!